← # ELAC & ALAC COMMITTEES/ LES PYROMANES-POMPIERS DE L’ONU EN AVEUX : LA LIBYE LIVREE AUX GANGS ISLAMO-MAFIEUX EN 2011 ! « Israël: cadeau empoisonné de Trump. This entry was posted in # ARTICLES BY LANGUAGE, # III. Luc MICHEL/ MULTIMEDIA, # VIII. 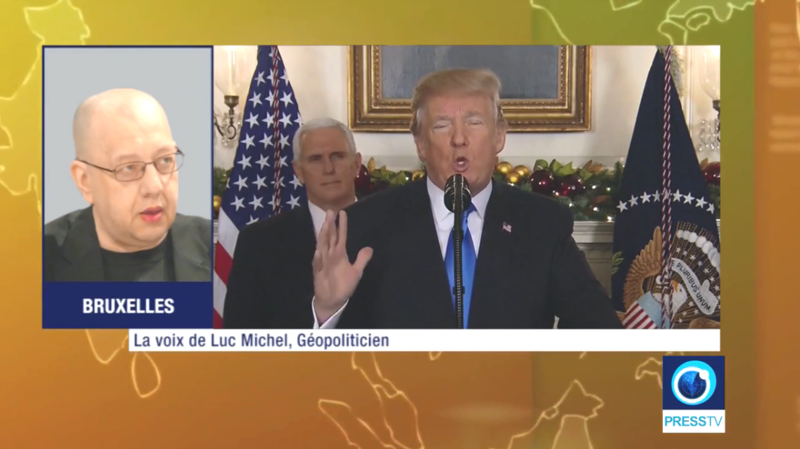 Luc MICHEL/ GEOPOLITIQUE & IDEOLOGIE/ GEOPOLITICS & IDEOLOGY, * Arabe/Arabic, * Français, * LM sur/on PRESS TV, * LM/ Geopolitics/ Arab World & Great Middle-East/ Monde arabe & Grand Moyen-Orient and tagged Al-Qods, Israël, Jérusalem, Luc MICHEL, Palestine, PARS TODAY, PCN-SPO, sionisme, Trump, USA. Bookmark the permalink.